UU’s Zach Bates (pictured) had 4 points, 3 assists and 3 rebounds in Saturday’s loss at Shepherd. 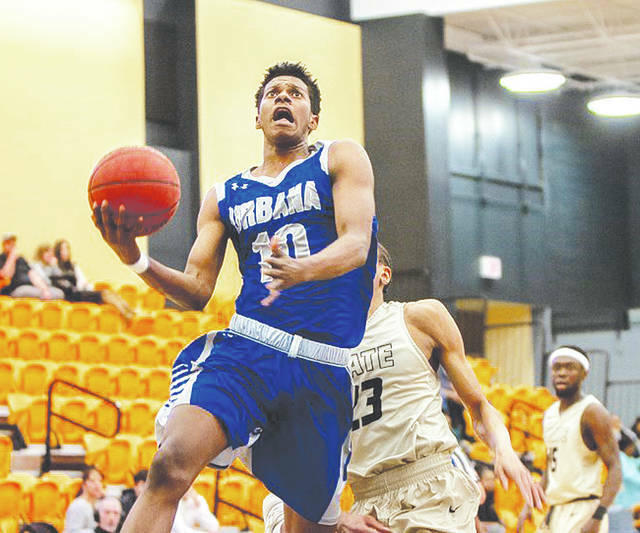 SHEPHERDSTOWN, W. Va. – Fresh off its upset win at MEC-leading Fairmont State, the Urbana University men’s basketball team couldn’t keep the momentum rolling in Saturday’s 78-66 setback to Shepherd inside the Butcher Center. UU (5-9, 3-7 MEC) led by as much as six in a tightly-contested game that featured 12 lead changes. Datrey Long’s layup with 6:28 remaining put the Blue Knights down two, but the Rams countered with the game’s only extended run to outpace UU, 19-9, down the stretch. SU (8-8, 5-5 MEC) shot 68 percent (17-25) in the second half to power past the Blue Knights. In the first half, Mike Ryan gave UU its first lead and then a bucket later on by Zach Bates put UU in front 18-14 with 8:39 until halftime. Both teams shot 48 percent during the first period as the margin stayed within four points with seven lead changes. Matt Treacy stayed hot from the field and put the Blue Knights ahead 37-31 with a jumper to open the second half. In two games last week, he averaged 27 points and shot 68 percent from three-point range (11-18). SU countered with an 11-2 run to grab a 42-39 lead but it was short-lived after Ethan Snapp tied it up on a trey. The two teams continued to slug it out in the second half as Treacy drilled back-to-back threes to even the score at 50-50 with 10:47 left to play. Soon after, Long’s old-fashioned three-point play gave UU its first lead since early in the second half, 53-52. However, the Rams responded once more with a 7-0 run and UU never reclaimed the lead. Treacy’s 21 points (5-9 3FG) led the way for the Blue Knights while Long finished with 13. Malik Jacobs ended his season-long streak of scoring double digits with nine points but contributed on the glass with five boards. Snapp added eight points and three assists. UU took care of the ball with only seven turnovers but struggled to score late in the game. The Blue Knights shot just 36 percent in the second half and finished 42 percent overall from the floor. UU made nine threes on 24 attempts from beyond the arc. Meanwhile, SU shot 58 percent for the game and knocked down 50 percent (6-12) from three-point range. UU hosts No. 9 West Liberty (13-2, 9-1 MEC) on Wednesday at 7:30 p.m. in the Grimes Center. The Hilltoppers are coming off a double-overtime victory over Concord on Saturday, 109-108.
https://www.urbanacitizen.com/wp-content/uploads/sites/36/2019/01/web1_uubates.jpegUU’s Zach Bates (pictured) had 4 points, 3 assists and 3 rebounds in Saturday’s loss at Shepherd.